This article considers the necessity of a conceptual approach to Hung Kuen forms execution to preserve the purity of the style as taught by master Chan Hon Chung in his gym at 729 Nathan Road. I studied with master Chan from 1977 until the shutdown of the Hon Chung Gymnasium, then in my elder brother Cheung Yee Keung’s clinic. I do not call myself “sifu”, but I recently decided to hand down to a selected number of young friends what I learned and understood in 40 years of daily practice. The desire to pass the art as uncontaminated as possible brought me to reconsider every detail from a different perspective, with the intent of avoiding unconscious changes and arbitrary superstructures. The path to the essence of the art is full of traps: worried that my memory could mess up something (and curious about the Hung Kuen world), I started surfing the Internet to verify my forms with those of other Hung Kuen practitioners in the proximities of my family, such as teachers who learned from my elder brothers and/or their students. But what I find is often unfamiliar and unfitting with what I learned and trained for so many years in Hong Kong. I can exclude any major defaults of my memory: I never stopped training and I keep a huge archive of pictures, notes and even some movies taken back in the days. I am also sure that my elder brothers teach a strictly kosher art. So where’s the bug?. I want to point out that I have no critical intents towards any practitioners, I admire their commitment and the passion. I am just trying to investigate the reasons of an involution of the traditional Hung Kuen that could eventually lead to an irreversible denaturation and loss. I wrote “involution” and I mean it. From what I see, in the West the essential and minimalistic Hung Kuen of Chan Hon Chung is turning into something complex, if not baroque. 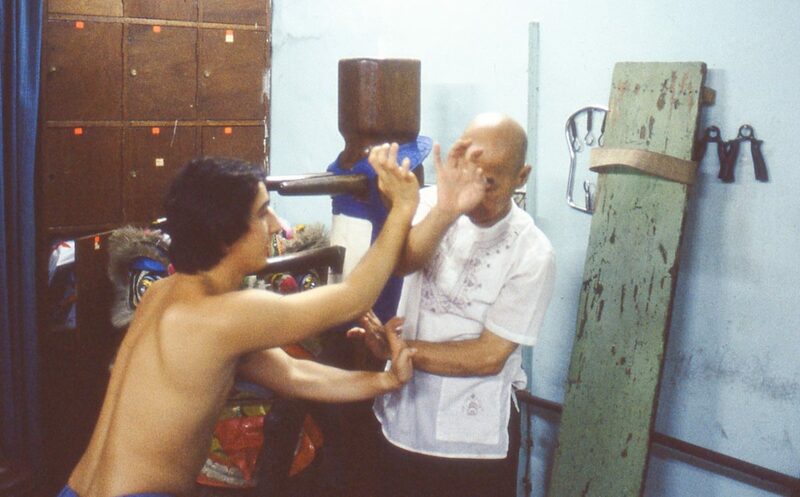 The fixed scheme of the classic Hung Kuen action more and more frequently gets overhanged and diluted by a formal superstructure of extra-movements extraneous to the style taught by master Chan. Taking for granted the good faith of the practitioners, I have long considered the possible causes of this denaturalisation without being able to identify them, until a few days ago. The lighting came while training with a “nephew” whose execution of our famous “twin tiger claws” was not convincing. Asked to explain why he performed it that way, he replied with the traditional “the opponent strikes bla-bla, so I block with my bla-bla, then he strikes again bla-bla and I grab his arm bla-bla, then counterattack bla-bla…”. All of a sudden a bell rang in my head. I told myself: hey, but we are discussing a technique that is the most respected, beloved, iconic symbol of the Hung style and we must give for granted that if the opponent does not attack exactly as expected, our “double tiger claws” becomes useless. Are we kidding or what? What I unconsciously already knew had finally surfaced to my consciousness: the real issue, the manhole, is the desire to find a rational, precise meaning to each technique of the forms. The “he strikes here, I block and counterattack there” approach to the forms builds up a superstructure of movements coming from one’s personal martial experience and feeling. Logical and useful when teaching to a beginner or training the applications, this stereotyped approach brings to a progressive, unavoidable modification of the form, eventually to a denaturation of the art. When training a form, the advanced student should first understand the one deepest meaning of each technique, then perform it in its pure conceptual way. Let’s go back to our beloved “double tiger claws”: its ultimate meaning is the idea of throwing two or three palm strikes on the sides of the central line, at different levels, intercepting an attack while striking back, with the option of a grabbing and pulling followup. The correct way to execute the “double tiger claws” in the form is thus throwing the hands forward with an imperceptible interval. The different usage options will then be investigated when training the applications of the forms. Identifying the ultimate essence of each technique and strictly focusing on it when training the forms produces a simpler, cleaner, more economical, more faithful to the origins, kosher Hung Kuen. And this classic conceptual approach opens a much wider scenario of applications, bringing the practitioner to a more realistic and effective exploitation of his workout. As usual, feel free to write for any further information about this matter.